The JNF is also facing criticism from organisations such as the Movement for Reform Judaism who are “surprised and dismayed” at the decision to host Lieberman. A Liberal Judaism spokesperson has already stated that “it cannot support the invitation”. Lieberman, a member of a far right political party, has publicly stated that “it would be better to drown these [Palestinian] prisoners in the Dead Sea” and added that he would willingly supply buses to take them there. 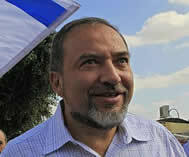 Israeli journalist Neve Gordon, says that “Lieberman’s message and style are not only violent, but have clear proto-fascist elements; and, as Israeli commentators have already intimated, he is extremely dangerous”. Michael Kalmanovitz of International Jewish Anti-Zionist Network said that “the JNF’s constitution is explicitly racist – it states that land and property will never be rented, leased or sold to people who are not Jewish”. Campaigners have called this process ‘ethnic cleansing’ and point to the effective subsidy of the JNF’s activities through its charitable, tax-exempt status here in the UK. Following David Cameron’s resignation last year as honorary patron of the JNF, the first time in the history of the JNF that a British Prime Minister has not held this position, sixty-eight MPs signed an Early Day Motion stating that “there is just cause to consider revocation of the JNF’s charitable status in the UK”.